Lotus driver Romain Grosjean has been given a 20-place grid penalty at the Abu Dhabi Grand Prix for changing elements of his power unit. Formula 1 rules state that a sixth change of any parts of the power unit results in a sanction. Lotus have decided to use a sixth internal combustion unit, turbocharger and one of two energy-storing units. 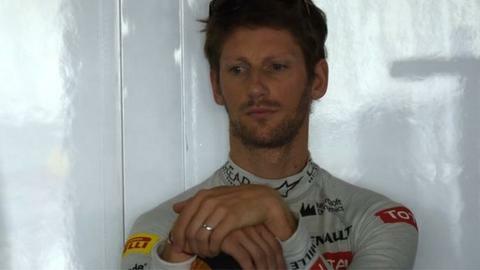 With only 20 cars on the grid, the penalty means that Grosjean will also have to serve a time penalty. Usually there would be 22 cars on the grid but with Marussia absent after ceasing to trade, Grosjean would not be able to serve the full grid penalty even if he qualified on pole. At any other time of the season the remainder would carry on into the next race but with Sunday's race the last of the campaign, the penalty will be served in full this weekend. Regulations state that an outstanding grid drop of one to five places will equate to a five-second penalty, a drop of six to 10 places equates to a 10-second penalty while qualifying in the bottom 10 will result in a drive-through penalty.